Posco’s Steel Village project was introduced as an outstanding example of corporate social activity at a high-level political forum on sustainable development hosted by Korea’s Ministry of Foreign Affairs at the UN headquarters, the company said Wednesday. Through the Steel Village project, Korea’s No. 1 steelmaker has been supporting social minorities and those whose homes have been destroyed in natural disasters with its steel products since 2014. “CSR efforts such as Posco’s Steel Village project is one that changes international society’s paradigm of developing countries,” said Cho Tae-yul, South Korean ambassador to the UN. 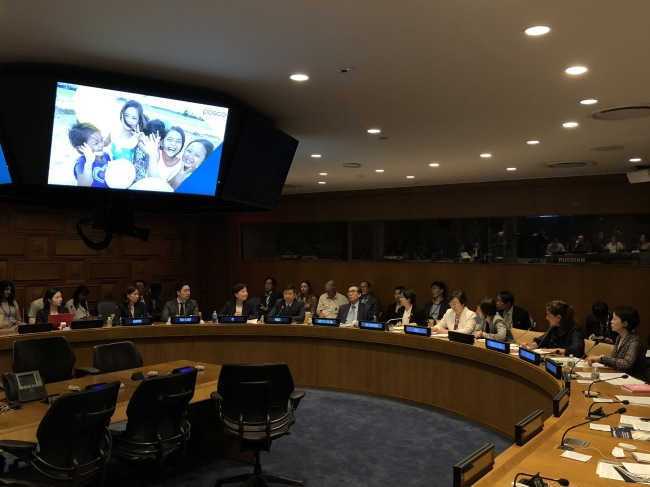 Posco’s corporate social responsibility work was introduced to 193 UN member countries as a model example of sustainable development efforts at the UN headquarters in New York. The company has constructed 104 steel houses and steel bridges in Vietnam since 2014, and donated a steel dome to a school in Thailand this year, it added. The project was also registered as a model example on the UN sustainable development goals website last November, and at the 51st session of the UN Commission on Population and Development this April.